After it’s launch in 2010, Instagram swiftly achieved a lot of popularity, and the result is, Instagram now has 800 million active monthly users. Doesn’t it sound crazy..? With a massive number of monthly active users, we can clearly see Instagram’s power. It’s a wonder that how a simple photo-sharing app could transform into an immense marketing solution which enables users to explore a business’s visual identity. 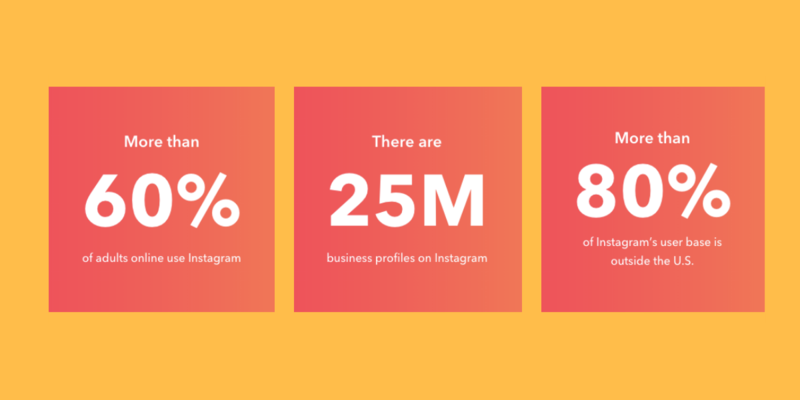 According to HubSpot research, there are more than 60% of adults who use Instagram and more than 25 million business profiles are active on this thrilling platform. Isn’t it surprising? Definitely YES…! I had never thought about it Instead what was I doing, just scrolling through my personal feed multiple time in a day. However, as I researched and learned so much in the past years, It is clear that Instagram isn’t for the personal use anymore. This nationwide platform allows an extensive opportunity to the businesses to increase their brand awareness and introduce products. Instagram is one of the powerful social media marketing channel, that has the capability to serve best as other social media channels. Do you know Instagram has the highest engagement rate, higher than Facebook and Twitter, Yes, you heard it right. Instagram offers huge opportunities to brands and gives you the freedom to reach your potential audience and flaunt the content in front of them in an authentic way without persuading them to buy. This is the beauty of Instagram. So, before introducing your business to the world, you need a well-customized business account. Let’s dive directly into the first step of Instagram. The very first step to implementing a successful Instagram marketing strategy, it required a rich profile for your business, you need to have an up to date Instagram account. If you already have, then good, and if you don’t have, download the Instagram App and signup up with your email or with Facebook. Once you have created your account, It’s time to enter all the required fields, enter your actual business name so that your profile is recognizable to the visitors. Next, fill all the required fields such as update profile picture that associate with your business. After setting up the profile image, you need to fill the bio section, which indicates what your business is all about. Instagram gives you 150 character limit, so you have to define your business in this character range. So, basically, where your goal is to grab your audience’s attention and give them a reason to follow you. In the bio section, Instagram offers a place for a clickable link. So, try to give your bio a crispy twist that encourages profile visitors to click on the link and take a specific action. When it comes to link, it is always a good practice to use shortened URL, you can easily shorten URL with tools like bit.ly and goo.gl. The benefits are, you can easily track, how many clicks you are getting from Instagram. It helps you to determine how much traffic Instagram is driving to your website. As your main goal is to reach your audience and aware them towards your brand so, your profile should be a business. The business profile gives you an extra feature that you don’t get in the normal profile, With the Instagram business profile, you will get contact, email and direction button also gives you all the insights to understand the behavior of your audience. But, to switch your personal profile into a business account, you just need a facebook business page. For Example: Take a look at the Wix.com's image post, that catch the instantly. Instagram provides you up to 2K character limit in caption area in every post. So, It’s a great way to share the story behind the post. 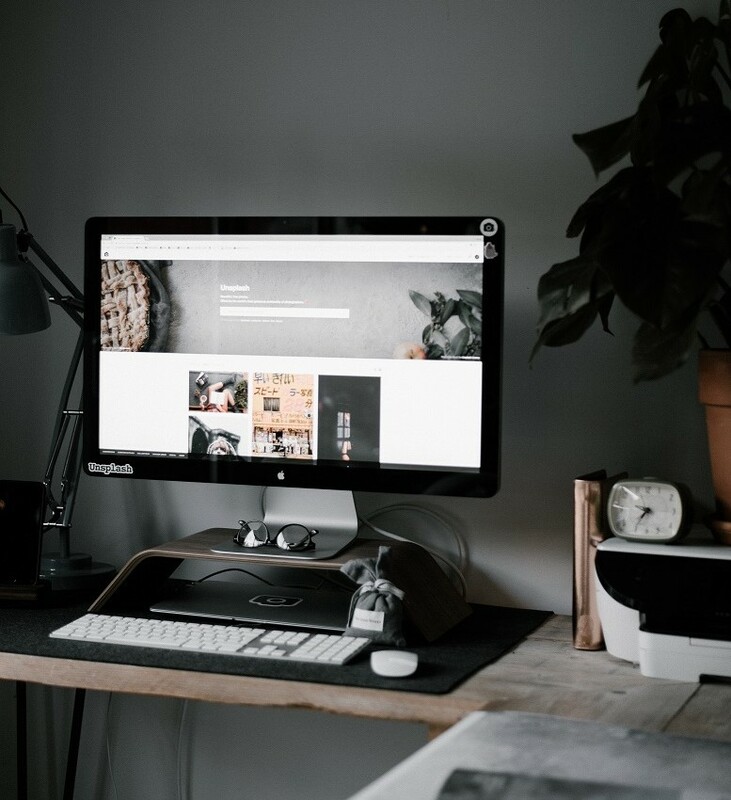 Write as informative as you can, but try to write important parts on top, as you noticed, sometimes Instagram shows three to four lines of every caption and you have to click on ‘Click More’… to see the full story. Want to see a good example of a long caption? 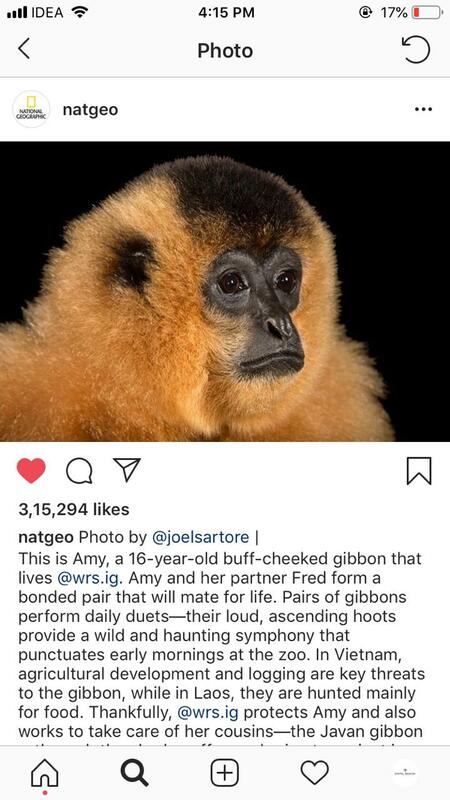 visit NatGeo, they give an instructive long caption to every post with such intensity. Also, If you are ever in doubt as to what to write, just keep it short but, short captions allow your visuals to do the talking. Pro Tip: Don’t forget to include a call to action in your caption, because It encourages your audience to like, comment and shares your post. There would be possibilities that they will visit your profile, click on your website link, see your products, services and make a purchase. Besides, try to add geotag in your post. Did you know that posts tagged with a location see 79% higher engagement? Adding a geotag gives users another way to find your content, which can lead to higher engagement. Hashtags are nothing but the keywords and phrases that spelled without space and indicated by the ‘#’ sign. It might surprise you to know that on Instagram, 80 million photos are shared on a daily basis. With such huge content, It’s quite tough for your account to get noticed. 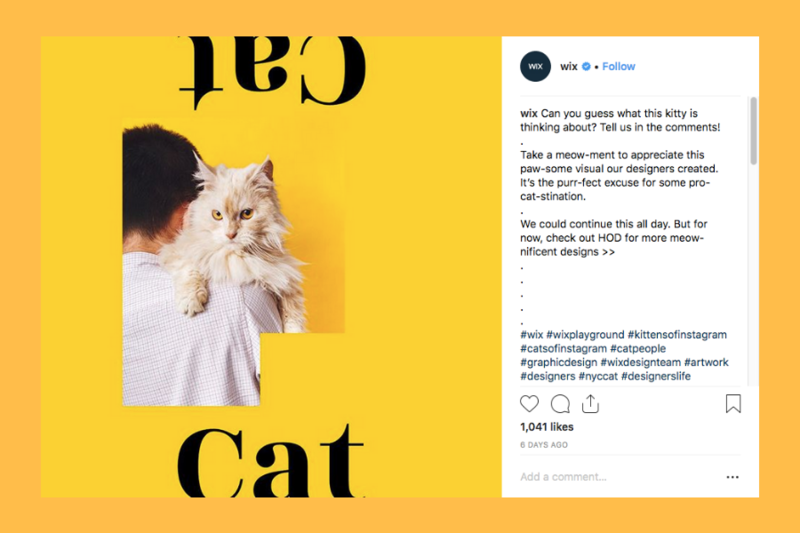 When it comes to strategizing marketing for Instagram, it utterly differs from other platforms and requires a distinct marketing strategy. Before getting started with Instagram marketing, you should strategize everything, because a good strategy always works, It helps you to deliver the best and gives you a fruitful result which you are expecting. When it comes to marketing, It’s all about delivering the right content to the right person at the right time. Once you understand the demographics, your main work is done. Instagram demographics have veered toward younger generations since its inception. However, new statistics from the Pew social media report show older generations are starting to embrace the app a bit more. Also, of all of those age groups, the dominant gender on the photo-sharing site is still women. Competition Analysis is one of the important work, After analyzing your audience, see what other marketers in your industry are doing. If you know your competition, start spying them by checking their profile. Conduct a quick audit and see what type of post they are posting, on which day and time, which post are getting high engagement, what popular hashtag they are using in their post, what type of caption they are using long or short, how often they post and how fast they are growing. All this information helps you to get started in the right direction. Don’t miss any opportunity and you’ll see the success, as it helps you to kickstart your business.